Published January 30, 2015 By Leisa Good This post may contain affiliate links. Regardless, I only recommend sites I've researched and/or used and trust. Would you like to work from home for an international company? Are you comfortable working phone jobs from home? Do you prefer customer service type jobs over sales jobs? Then Concentrix might be something for you to further explore. Concentrix is an international staffing company, which supports the actual Concentrix clients who are in Banking, Healthcare, Insurance, Technology, Consumer Electronics, Retail and e-Commerce, Government, Media and Communications, Travel, Transportation, Tourism, and Automotive. For 40 years, Concentrix has prided itself on bringing speed, flexibility, and transparency to every customer experience and transaction, especially now in this new digital age. Concentrix has over 54,000 staff members worldwide and has a presence in 24 countries including the United States. While there are many different positions being offered at Concentrix, the one being discussed in this article will be the virtual customer service position. What Do Virtual Customer Service Agents Do at Concentrix? Again, virtual or remote customer service agents serve the Concentrix clients, however they want to be served. 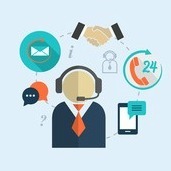 Whether it is by email, phone, and/or web channels—you will be supplying customer service in some capacity to them. You will be typing, answering emails, scheduling appointments, performing Internet research, and a variety of customer service type duties for Concentrix’s clients. Concentrix doesn’t list who their clients really are, but after looking over the some of the remote job postings, it appears that Apple and Samsung are two of them. Concentrix chooses more of the role of a staffing agency, where you will be an actual employee reporting to them and won’t know who the client is until you have landed the position. It would be just like if you were working at a temp agency such as Manpower with Manpower being the employer. What Are the Equipment/Computer Requirements to Work for Concentrix? an updated hardwired PC or laptop with high-speed Internet which passes the test. anti-virus and anti-malware software installed and actively running. a landline phone and a headset connected to it. a quiet office space with minimal distractions. During the application process, your PC or laptop will be tested for speed. It must have a download speed of 5 mbps and an upload speed of 1.5 mbps. You are also required to have a 17” monitor screen with a resolution of 1024 X 768.
be experienced with at least one year of customer service. have strong computer and written skills. have a passion for using technology. enjoy working with and helping people. be passionate and motivated about their work. interested in potential career advancement. As stated previously, you are an employee of Concentrix. It doesn’t even appear that Concentrix uses independent contractors. The good news is that they do offer benefits. You will also need to submit to a background check, and depending upon the client in some cases a credit check too. What Are the Employee Benefits at Concentrix? Depending upon whether you are part-time or full-time, remote customer service agents are offered paid holidays, a pension plan, paid training, and monthly incentives. If you become full-time, then you are also offered health insurance. What is the Pay Like at Concentrix? Payment for the remote customer service jobs seems to be between $9.25 to $10 an hour depending upon the client. What Do Others Say About Concentrix? The ratings average out to be 3.3 out of 5 stars, which is average to slightly above. You can read them for yourself at the Glassdoor. What is My Overall Impression of Concentrix? I have heard both good and bad. Paycheck errors and high turnover seem to be the two biggest complaints. How Can Someone Interested Apply to Concentrix? Interested individuals may go to the Opportunities part of their website and apply. Be sure to check the box to the left for United States. Then type the words “customer service” in the search field. Biggest waste of my time appylying with them. I took their test and have experience. They gave me a loser robot rejection email message of “not moving forward with application.” I never like agencies. do they ask for any fees like arise does ? Many of you have asked me about their schedules, and the schedule really depends upon which client you work for. any information about their schedule?